There is a lot of hype around tape-what tape, what technique, what colour! The hype is not fully underpinned by robust academic rigour and yet do I use tape with my patients? Yes I do. Let’s explore this. Overall the literature is poor quality with varied methodologies and as such there is no definitive answer to ‘should we use tape in patellofemoral pain, (PFP), to which patients and how?’ As always in these situations I go back to clinical reasoning: what am I trying to achieve, and how can I best do this? Will the patient be able to replicate this themselves? Here I present the most common scenarios I tape for, and what techniques I use. 1. Fat pad offloading. Fat pads often become oedematous and then impinge between the tibia and patella even more. Taking the pressure off the fat pad can really help break this cycle. First though I need to establish which part of the fat pad is impinged, and why. 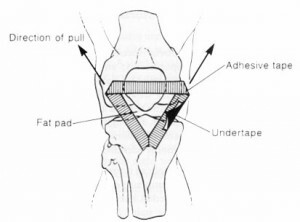 If the central part of the fat pad is being impinged, (frequently due to tight quadriceps or uncontrolled hyperextension) then an elevating taping technique is useful to elevate the whole paella and tip the distal pole of the patella off the fat pad. NB. I would not perform this technique on someone with patella alta, (ie long patella tendon) as it may increase their instability. If the fat pad is impinged in its supra-lateral corner it is more likely to be patella tilt and/or poor control of femoral internal rotation. 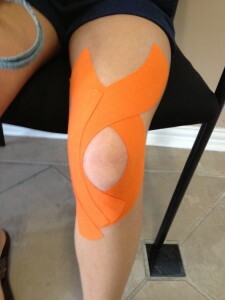 For the patella position I would be more likely to use a McConnell taping technique. If the femur is more the issue then a spiral from the medial knee across the anterior thigh diagonally to the glutei applied in slight knee flexion and femoral external rotation helps to give feedback if the femur starts dropping into internal rotation. Excess retropatellar pressure to the subchondral bone is often, (but not exclusively) from patella malalignment. If the patient has a good pain response from manual medial glide and/or tilt correction with a task such as squatting or step ascent then I will try a McConnell taping as shown above. If pain relief is gained by tape I am all for it as long as a long-term dependence doesn’t ensue! Reduced pain helps to win the patients confidence in you, and will then often give you a window of opportunity to do exercises, re-educate movement that would previously have been pain limited. There are many other taping techniques out there, some of which I occasionally use. However, the aforementioned are my ‘go to’ techniques. I’m sure this would be different for another clinician. Neither will be right or wrong. What tape? I consider rigidity, skin tolerance and ability to stick, especially on hot, sweaty skin. Finally and most importantly most clinicians in the UK do not have the luxury of seeing patients several times a week. If you are planning on using tape as a key part of your treatment then the patient has to be able to replicate it. I recommend; keep it as simple as you can and if the patient has a phone with a video facility then get them to film you talking through applying it. Hi I dislocated my pattela and 9 weeks later my pattela is still very high. Is this normal? Can I fix it? A high rding patella is usually caused by a long patella tendon which you can't change without surgery. This is a risk factor for dislocation, but there are many patients with this , (patella alta) who do manage to avoid surgery through keeping strong. I hope that helps and your knee is recovering well.